With the chilly temperatures outside, most of us are bundled into our winter clothes and snow gear to stay warm. If you have kids, it's pretty likely that at some time or another you've overdressed them to the point where they can't move. Unfortunately, even with the good intentions of keeping our little ones safe, we might be putting them in more danger by combining winter outerwear and car seats. Ruth from Viva Veltoro has all the information you need from Allana Pinkerton, Certified Child Passenger Safety Instructor and Global Safety Advocate for Diono, to educate yourself about the dangers of your children wearing puffy coats while in their car seats. Make sure you check out her post for a full list of Do's and Don'ts when it comes to winter car seat safety. 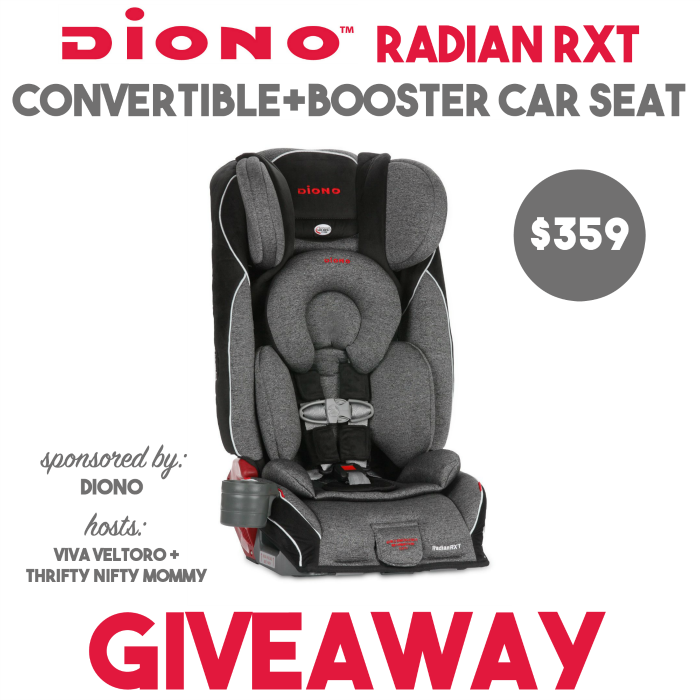 Diono wants your little ones to be the safest they can be, so they're giving one lucky person a Diono Radian RXT Convertible + Booster Car Seat! Also, be sure to check out Viva Veltoro's review of the Diono Radian RXT and Thrifty Nifty Mommy's review of the Diono Radian RXT to see these seats in action. To enter to win a Diono Radian RXT, just use the Giveaway Tools form below. Open to the US, ages 18 and up. Ends 2/26/16 at 11:59 PM EST. What I learned: all Diono car seats provide reinforced side-impact protection, and some models offer the increased protection of an adjustable head support. Currently, there is no U.S. or European regulatory side-impact testing requirement.A manufacturer can make the claim of "side-impact safety" without meeting any standard.Diono’s RadianRXT and Monterey models were side-impact tested to the widely accepted German standard established by ADAC, Europe’s largest automobile club.